03/17/2019 03/22/2019 - by Mark Hyde - 5 Comments. Budget-class laptops rarely offer niceties but the Eluktronics N870HP6 Pro-X is one on a different pedigree. Designed for gaming and casual use enthusiasts, this sprawling 17.3-inch laptop tears through AAA gaming titles. You get the very best specs including a powerful 2.8 GHz Intel Core i7-7700Q (Quad Core) processor, brightly lit screen, Nvidia GeForce 1060 GPU, 16 GB DDR4 2400MHz memory and 256 Solid State Drive storage. With that, it offers good productivity performance at an affordable price, therefore, earning its stripes as our Editor’s Choice budget laptop-desktop replacement. Update: The Eluktronics N870HP6 Pro-X laptop is out of stock in Amazon so we recommend the Acer Predator Helios 300 instead. The past few years have seen manufacturers churn out new, better featured and capable systems. It is now evident that you can acquire a more powerful system with premium components for less money. As newfound systems trickle into the market, it is also now becoming less of a challenge finding a system (if you know what you’re looking for). The fact that laptops with premium components and gaming capacity are slowly becoming cheaper is very refreshing. It’s great seeing components from the most powerful builds in the industry finding themselves on budget machines. The Eluktronics N870HP6 Pro-X is one such laptop that caught our attention. It sports a combination of build quality, performance and battery life that’s setting a new bar in the gaming industry. It’s a great value laptop, with a full array of ports and a remarkable inexpensive price tag. So, should you buy from Eluktronics? Well, the Eluktronics Review is a great place to start your research from. Otherwise, the N870HP6 Pro-X is decent enough to consider buying. If you’re not into gamer aesthetics and just need a sturdy and versatile laptop to help you scratch a Battle Royale itch, then the Eluktronics N870HP6 Pro-X is perfect for you. This isn’t to say that it’s not attractive, no no! The design is seamless, sleek and attractive, but might not be up to par with Predator Series or other pimped out gaming rigs. The metallic chassis design is sleek but toned down such that it straddles the line between a gaming laptop and a casual laptop. Ultimately, apart from the freakishly large 17.3-inch display, there’s nothing much going for it that will get heads turning; it’s simple and Zen. So you can tag it along to your routine coffee shop and browse away without causing much attention to yourself. P/S The Eluktronics N870HP6 is just the larger version of the Eluktronics N850HP6 Pro-X we reviewed a while back. Under the lid is a 17.3 inch IPS display with 1920 by 1080 resolution display and matte coating to guard against reflections. The screen isn’t for you if you’re short on space. But if size isn’t a problem, it’s a neat solution for gaming, delivering an immersive gaming and multimedia experience. We loved the medium thin bezel and the webcam right at the top-center. The 2.0MP Full HD Webcam & Array Mic are a functional combination of Skyping and holding conference calls. 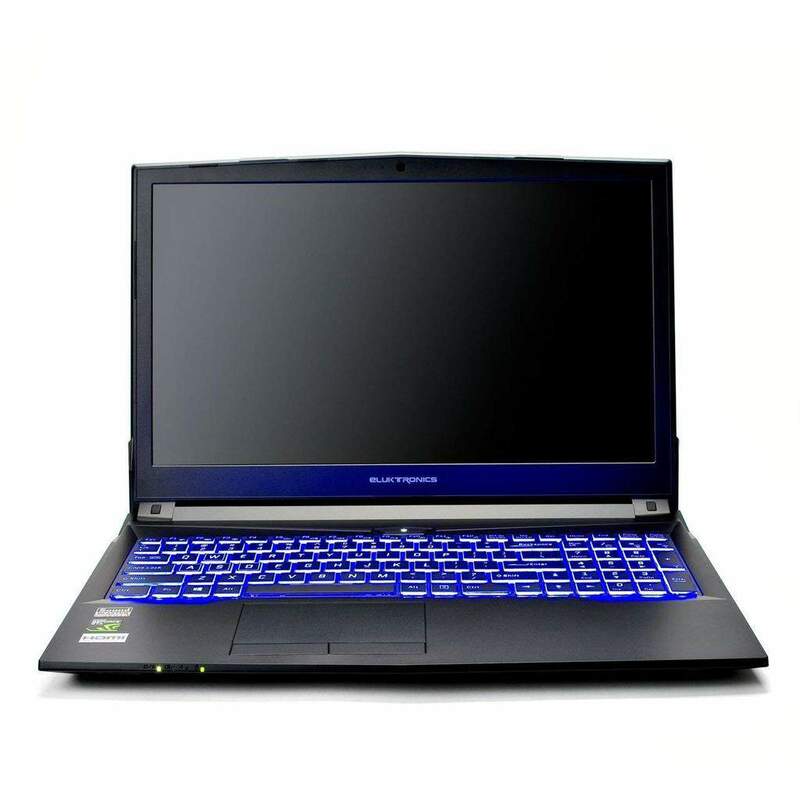 In comparison to other laptops in its price tag space, the Eluktronics N870HP6 offers a brighter screen with better color gamut (72% NTSC). For this one reason, it trumps over the Acer Predator Helios 300. Other than that, the Predator 300 has almost similar specs but is lighter weighing in at 5.95 lbs while the N870HP6 comes in at a heavy 6.9 pounds. The sides of the Eluktronics N870HP6 Pro-X are lined with a set of ports and a massive venting grille running on the right side. The left side, like on many laptops, is the richest section with the most ports. You get the Kensington Lock, Power supply port, 1 USB 2.0, 1 USB 3.1 Gen 2 port (Type C), HMDI (with HDCP), 2 Mini DisplayPort, Gigabit Ethernet, and micro-SD card slot. Meanwhile, the right side houses a single USB 3.0, one USB 2.0 port, a headphone, and finally microphone jack. There is no Optical drive which suggests you have to look for options online. This is Not a killer tradeoff anyway. Other connectivity options available include Intel Dual-Band Wireless-AC 8265 2×2 for wireless connections to your internet router or other provider and Bluetooth 4.2. For security, Dell added the TPM 2.0 which enables biometric logins and security through passwords. The most iconic part of the N870HP6 laptop for us is that it spots premium features that allow it to stand next to the big fish of budget gaming laptops. For the most part, the Eluktronics N870HP6 competes on a feature-to-feature basis with the Acer Predator Helios 300, Dell Inspiron i7577 UHD (i7577-7425BLK-PUS) and the ASUS ROG Strix GL753VD. It’s easy to say that the necessity of speed is quite real and a requirement for gaming. 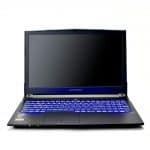 Admittedly, the Eluktronics N870HP6 makes an impressive gallop with its 2.8 GHz Intel Core i7-7700Q (Quad Core) processor. The King-of-the-Hill Acer Predator Helios 300 also sports the same processor with capacity to clock highs of 3.8 GHz on Turbo. This processor is definitely one of its strongest features that make it the workhorse it is. On the CPU Benchmark, this Kaby-Lake H processor managed to garner an Average CPU Mark of 8873. Ideally, that is a great performance that’s roughly on par with the Core i7-6970HQ. Our review unit also comes with 16 GB DDR4 2400MHz memory. On many scales, 16GB is plenty to run software, games and multitasking tasks. College students and gamers alike will find this an added advantage when browsing with multiple tabs open. For general performance, like handling demanding multimedia projects that require multiple threads to function, the Eluktronics N870HP6 performs well. When not gaming, Architecture and Design students running architectural models with 3D software will find working with this Windows 10 laptop a cinch. As for storage, you get the premium 256GB solid-state drive (SSD). On an optimistic note, 256 GB SSD is great for loading software and fast boot ups. Loading games also get a boost such that if you’re planning to immerse yourself in some Battlefield action, it only takes you 3-5 seconds to be set and gaming. For storage hogs like me, you might need to purchase a separate 1TB HDD for mass storage to cover your photo gallery, movie and music collection. You can opt to add the Hard-drive on the included bay; 2.5” 7mm HDD/SSD, SATA III interface (Caddy & Mounting hardware included). For gaming purposes, Eluktronics uses the Pascal architecture, Nvidia GeForce GTX 1060 graphics card. This allows gamers better frame rates on recent AAA titles. Although most games remain bottlenecked by the GPU, compared to the 1080 GPUs, there still is some remarkable gameplay on some titles. The best part is that GTX 1060 fares just as well as you’d expect and is perfectly capable of 1080p gaming. Demanding games push the card to the limit which means dialing down on the resolution. But in most instances and titles, the card should play smoothly on high settings. If you’re into VR experience, the GTX 1060 should manage well too. High pitch sound, but stereo is great. The fan runs quietly too, nothing too loud. When it’s not gaming, the N870HP6 stays nice and cool, especially under simple workloads. The temperature at the bottom rises to 85 degrees Fahrenheit while not gaming, but it’s a comfortable threshold. On gaming, it can heat up to 115 degrees. The touchpad, however, stays cool throughout at a middling 83 degrees. Gaming laptops don’t show much promise on battery life, and the Eluktronics N870HP6 isn’t any different here. On our battery rundown test, it managed to last 3 hours 57 minutes on continuous web browsing over Wi-Fi. On most fronts, that’s almost the average battery life expectancy for a gaming machine. That’s a good reason why gaming laptops typically aren’t used off the charger for too long. Still, while normal, it wouldn’t hurt to have some extra juice on the battery. In comparison, the Acer Predator Helios 300 offers relatively longer battery life than expected. It ran for 6 hours 47 minutes. First glance of the Eluktronics N870HP6 Pro-X reveals a modest laptop with plenty of screen estate to go around. Its look might not be every gamer’s cup of tea but it has more under its belt than it actually shows. The On-paper specs give you a grip of its resilience but the real value shows on use. On the gaming front, it stacks well against other competing rigs with smooth playable 60 and above frame rates. Best of all, it does it without bursting your wallet. It crosses paths with the Acer Predator Helios 300 on many spheres; mostly specs. Still, for the better part, the Eluktronics N870HP6 stands out for a better/brighter display and large screen estate, making it the versatile choice. It’s one downside, however, is that it sacrifices portability while at it and also costs about $100 plus more than the Predator 300. Bottom line, the Eluktronics N870HP6 Pro-X is a PC that marries the best things about a gaming laptop with the latest components. Currently, only a few laptops in its space manage to achieve that without ruining the price tag. So, this is a powerful, well-designed laptop bundled in an exclusive package that’s hard to turn away from. It’s a difficult choice to deny especially if you’re interested in gaming and are on a budget. With all these in mind, it easily earns our Editor’s Choice for a midrange budget gaming laptop. You should probably check it out.